Here’s a good horticultural challenge: A short growing season, the prospect of frosts in May and again in August and a general lack of space. This is urban gardening for me in Calgary (over 1,000 m altitude and daily annual mean temperature range of -8.9 to +16.2 deg C). Over the last few years I have approached vegetable gardening with raised beds (three as of this year), reclaiming value back from idle lawns. Their structure helps with soil quality and (combined with plastic sheet covers) heat retention/frost control. And while my back garden has a good aspect (facing west), the best, sunniest, part of the garden is actually the concrete path that runs along the southern edge of the garage wall. In April, when I was over in The Hague, Netherlands for Shell’s Powering Progress Together event, I was inspired by the work of the Rotterdam Resilience Challenge team who have set about a number of initiatives designed to improve resilience to food, water and energy challenges in the face of climate change and growing urbanization. One of their projects is to create Edible Walls, which they define as surfaces with edible plants connected to a vertical structure. 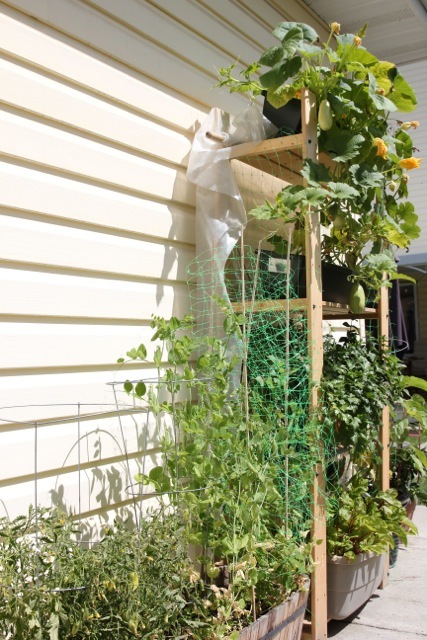 My adaption to this idea/structure when I returned to Calgary was to use some shelving bought from IKEA (it’s cheaper than making it yourself), paying attention to tilting the growing boxes to get better sun alignment and, given our frosts through May, to add in a plastic sheeting that could be rolled away once things warmed up. Several advantages to this growing system have become apparent this season. First, it is definitely a space saver (I have four growing beds on top of each other, filled with Swiss Chard, various herbs, zucchini and pasta squash). Second, it gets these plants off the ground where they are at more risk from pests and disease. Third, they seem to have fewer weeds. I will await cropping time to determine if yields are better…. Beyond my own backyard efforts there are some other advantages to this approach when scaled up. When placed in public spaces, these vertical gardens can certainly raise awareness of where food comes from and encourage city dwellers more broadly to grow their own food. Sharing experiences and stories about this can help with social interaction/cohesion. 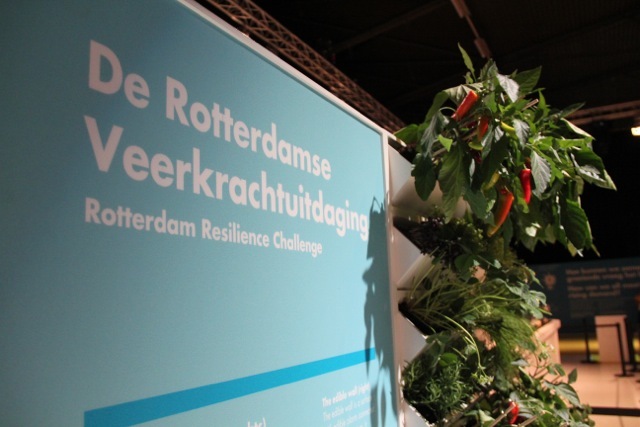 The Rotterdam Resilience Group believe that, if applied across cities, edible walls can provide direct local access to food, thereby making food supply chains more resilient. Willem Van Cotthem in his blog Container Gardening has made the case that this “own fresh food” concept can play an important role in the well being of families, especially children, when applied in food compromised places around the world (he takes a big interest also in Desertification and food growing). It has been my own experience that urban gardening has allowed my own daughter to form important connections to soil and growing things that, sadly many children living in cities have lost or are struggling to retain, when most schools have no resources or room in their curriculum for this education.